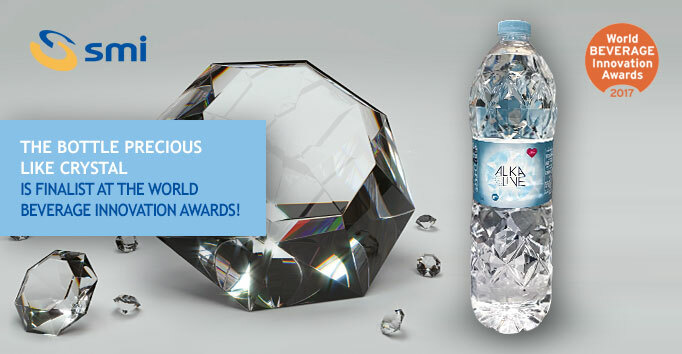 The bottle precious like crystal is finalist at the World Beverage Innovation Awards! The new PET container, designed by SMI to bottle mineral water, combines all advantages offered by the ductile flexible PET material with a strong appeal design. The basic theme chosen for the new bottle is crystal, which symbolises how precious, pure, limpid and transparent the water it contains is. While waiting for the election of the winner of the World Beverage Innovation Awards, contact our Sales Department and discover the container suitable for your requirements. We'll wait for you at Drinktec to show you our ECOBLOC® ERGON integrated system, the compact solution for producing, bottling and capping PET containers... even those with very original shapes.